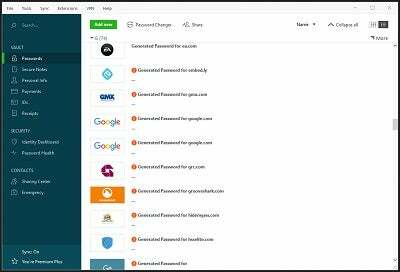 Dashlane is one of the best choices you can make for a password manager – especially in its latest incarnation, Dashlane 6. In the past, it’s felt like something of a runner-up to the likes of LastPass, but multiple updates have seen Dashlane establish itself as one of the best password managers around. It has lots of features including some that other password managers just don’t have, a simple setup, and a largely effortless process for logging into your accounts securely. In a world where you’re likely to have dozens of online accounts, and each should have a unique login, a password manager can be a lifesaver. If you’re looking for a great password manager that’s easy to use, then Dashlane keeps things secure and simple. Dashlane is a great way to securely store your passwords, instead of keeping them all in your head. It’s also a good tool for generally protecting your online identity with a built-in virtual private network (VPN), the ability to create new, strong passwords, and analysis for current saved passwords for weak ones. Dashlane is very well designed, and is a robust password manager. But, for all that greatness, you’re going to have to pay way more than you would with other options such as 1Password and LastPass – the free version of Dashlane is a touch limited. Dashlane has a new built-in VPN, which creates a secure tunnel between you and the Internet. This is a very simple feature that doesn’t offer the complexity or the choice of commercial VPNs–you don’t get to choose a server or country connection, for example. Nevertheless, if all you need is something to stay safe on public Wi-Fi then Dashlane’s new feature should suffice. Previous versions of Dashlane didn’t allow you to store files as attachments, Dashlane 6 changes that. Now, you can add file attachments to Dashlane’s Secure Notes section. That doesn’t quite rise to the standard of LastPass, which lets you add attachments to notes and password entries. Still, going from nothing to adding attachments to notes is a great step forward. With this new feature, Dashlane users get to store up to 1GB worth of file attachments. That’s a good amount of storage as long as you’re storing text and a few images containing important information. Database breaches of popular online services are a common occurrence these days, and they can expose everything from your login credentials, to credit card data, and home addresses. Dashlane 6 helps you track this critical information by scanning third-party databases for information you submit such as your credit card numbers or phone numbers. Dashlane won’t take any action unless you activate this feature and tell it which pieces of data you want to monitor. Users who opt for the Premium Plus plan get a few extras to protect their identity thanks to an agreement with consumer credit bureau, TransUnion. This feature includes identity theft protection insurance for up to $1 million, real-time credit monitoring, and identity restoration support (i.e. hotline telephone support). Some genuinely user-friendly features help distinguish Dashlane from its competitors. Once you’re set up, one of the first things you should do is fire up the desktop application, and select Identity Dashboard from the left-hand side under the Security heading. Here, you’ll get a quick summary of all the passwords in your Dashlane database. At the top is an overall assessment with a summary of safe, reused, weak, and compromised passwords. This is also where you’ll see the new Dark Web Monitoring feature that scans third-party databases of known data breaches for items such as credit card numbers and home addresses. This is a feature you have to activate on your own and explicitly tell Dashlane to track. If you have weak passwords that you’d like to change click the “Manage accounts” button at the top of the main Identity Dashboard window. This will kick you down to the Password Health section that’s listed just below Identity Dashboard on the left-hand side. In this section of the app, Dashlane shows you the full lists of compromised, weak, and reused passwords. From here, you can go through them one by one and change the ones that need changing. You can also use Dashlane’s auto-change feature to automatically change passwords for supported sites; however, in this section of the app Dashlane only auto-changes one password at a time. If you want to change multiple supported sites at once, there’s a way to do that in another section of Dashlane. Click on Passwords on the left at the very top, and, in the main portion of the window, you’ll see Password Changer at the top. Click that and a new window appears with all the various sites in your database that Dashlane’s auto-changing password feature supports. You’ll see how strong your various passwords are using color codes and percentages, as well as any that have been recently changed. To change multiple passwords at once, select their checkboxes or hit the top checkbox to change them all. If you have two-factor authentication active, Dashlane will even let you manage the secondary-code entry directly through Dashlane itself. Similar to other password managers, Dashlane has a secure notes feature for entering generic information you want to keep secure. There are also preset templates for items such as software licenses, Wi-Fi passwords, or membership details. The great part is in Dashlane 6 you can add attachments to your notes with a maximum of 1GB total document storage. This is great if you need to store a photo of a serial number or the answers to security questions for sensitive accounts. Interestingly, Dashlane has another section entirely for receipts. Instead of keeping them in the catch-all Secure Notes section, receipts are kept in their own section under Vault > Receipts. Here, you’ll see Dashlane’s automated detection in action again. When you buy items online, Dashlane will automatically stash your receipt. 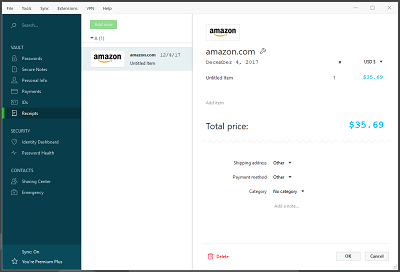 For cases where it doesn’t work (eg an unsupported site or service) there’s also an Add new button to manually input purchase information such as the amount, date, website, and so on. Dashlane also has an emergency contact feature that lets you give nominated family members access to your password database within 48 hours upon request. The 48-hour waiting period gives you time to reject the request should it not be an authentic emergency. You can also reduce the waiting period to none at all, 24 hours, or up to 60 days. If you don’t want your emergency contact(s) getting access to the entire treasure trove, you can give them access only to specific logins and notes. Finally, there’s also a built-in sharing feature that lets you share specific passwords with other people. Dashlane is an outstanding password manager, but there are one or two quirks and flaws to be aware of – particularly if you opt for Dashlane Free. The whole point of a password manager is to access your passwords when you need them. Usually, that’s via the browser extension. Dashlane rather flips the script on this – the desktop program is clearly the main interface, while the browser extension feels like an additional utility. If you run into trouble, you’ll have to open the desktop application instead of quickly clicking the extension icon. One problem I experienced, for example, is a site where I have two logins: an initial one via a browser pop-up window and then a secondary one within the web app itself. Dashlane was confused about how to handle this, and I had to open the desktop application to copy the correct password that I needed. It surprised me that I couldn’t simply copy a password from within the browser add-on. This is a perfectly common feature with other password managers. Dashlane offers a free tier, but with a few caveats. With the free option, your password database is limited to only 50 items. It also won’t be stored in the cloud but on a single device. That means if the device with all your stored passwords bites the dust you lose access to all your passwords. If you really want to stick with the free option, then I’d strongly advise exporting your database to an external (and encrypted) thumb drive at least once a week and after every time you change any password. Yes, manual backups are a pain, but if you want to stick to the free tier, it’s a sensible precaution. If you don’t fancy paying for Dashlane’s, then opt for LastPass, which does encrypt your passwords in the cloud, even on a free account. Dashlane has a free option, with some limitations. It lets you use Dashlane on a single device, with access to all the ‘on-device’ features of the paid-for tier. But, the free version doesn’t back up your password database to the cloud – it’s stored on the device only. Lose the device, and you risk losing your password database, unless you’ve created a manual backup. Dashlane is a little pricier than some of its key rivals, including LastPass. However, the Premium version of Dashlane is undoubtedly superior to Dashlane Free. If you get the Premium version for $60 per year you can sync your Dashlane database via the cloud across multiple devices. You also get a whole bunch of perks such as a free VPN, dark web monitoring, unlimited password sharing, and Yubikey authentication support. There’s also a new Premium Plus tier that costs $10 per month with all the features of Premium, and you get credit monitoring, identity restoration assistance, and identity theft insurance via TransUnion. Business users get the same feature set as Premium individual users except for the VPN for $48 per user per year. This professional version also sports smart spaces that divide work and personal passwords, administration console with customizable policies, and group management for secure password sharing. While there are plenty of password managers out there, there’s little doubt to us that Dashlane and LastPass are two of the best. If you choose to go for the premium version, LastPass is the cheaper of the two, but Dashlane has the edge when it comes to changing multiple passwords at once, plus the VPN is a nice addition for securing your browsing at airports and cafes. Read our Dashlane Vs LastPass guide to find the best password manager for you. It’s straightforward to get up and running with Dashlane – one of the reasons we rate this tool so highly. Dashlane locks all your passwords behind a single master password. You only have to remember this one to get at all the others. It’s important to make sure you pick a strong master password to protect all your other accounts. Choose something that is strong, easy to remember, but hard to guess for malicious hackers. Once the basic installation process is done, Dashlane asks you to add your personal information including your name, date of birth, and phone number. Dashlane uses this data to fill out the various online sign-up forms you come across. There doesn’t appear to be an option to skip this part of the process. Since it’s browser, based, however you can just close the browser tab and Dashlane will still open. If you’re a first-time user I’d strongly recommend going through the startup tour including adding your information for a faster way to fill out forms online. Dashlane logs you into all your online accounts through an automated detection feature. The program walks you through this feature upon setup. In practice, when you land on a sign-in form, instead of entering your details, click the Dashlane icon. Select the correct login account you want to use – it will show options if you have several accounts for one site – then, Dashlane takes care of the rest. Dashlane is a great password manager. Its auto-changing password feature is fantastic and robust, and the auto-login feature is intuitive to use. Plus you now get a basic VPN to keep you safer on public Wi-Fi hotspots. The drawbacks are minor enough that they won’t affect the majority of users. You can’t copy passwords from the browser extension, for example, and it’s more expensive than other mainstream password managers. Even so, we’d happily recommend Dashlane – go for the Premium plan for the best peace of mind or Premium Plus if you’re worried about identity theft, and step up your password security for good.